Can a church based on individualism sustain itself? 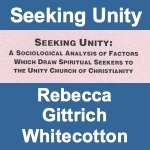 Rebecca Whitecotton's 185-page study of Unity is important for two types of readers: those who are attracted to Unity and its teachings but don't know exactly why, and those who lead Unity ministries but aren't sure what it is about Unity that resonates with congregants and society. Paragraph, by paragraph, she has provided insight into where we are in the Unity movement. But her insight is not just conjecture. Each conclusion is supported by survey data that has been shaped by decades of academic research. In other words, we learn what modern researchers are saying about American religion and we have their conclusions applied specifically to Unity's churches and its teachings. One final blessing in this study is that it was conducted in 1997, which may be the peak of Unity's historical growth. I will not comment here about what has happened since 1997. Each section of Rebecca's study is on it's own page and each page has a comments section at the bottom where you and others can share your thoughts about what Rebecca and others say. My hope is that this study will foster a lively and loving exchange of insights and opinions on how we move forward. If Rebecca's study were not blessing enough, it just so happens that she is also an author of inspirational children's books. And Child of Mine, Know This will open your heart. Visit and connect with Rebecca at Bright Treasures, where she publishes metaphysical and spiritual books for children. Visit Bright Treasures at www.brighttreasures.net, where Rebecca publishes metaphysical and spiritual books for children.